The Carter Team, looking forward to a long and relaxing weekend after the Christmas/New Years holidays, was contacted to provide florals and decor for an impromptu wedding on Jan. 2, 2010. 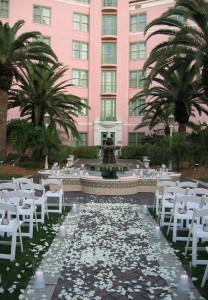 The bride and groom desired to capture romance and candelight in the Renaissance Vinoy Tea Garden and to transform Fred’s Bar, the hotels private dining room, into an upscale, New York inspired, dinner club for 60 people. Of course our talented team was able to create the proper arrangements and decor much to the couples pleasure. Thank you so much for everything you did to make our wedding so spectacular!! You really helped me create the WOW effect I wanted and it could not have been more perfect, thank you!! I managed to sneak in to have a look at Fred’s before the guests arrived and it was exactly what I had invisioned!! You were spot on with the table cloths and just seeing the whole colour scheme come together and really pop as it did was wonderful. 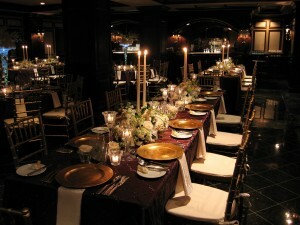 The napkins, gold plates, flowers, chairs…..everything was just magical!! 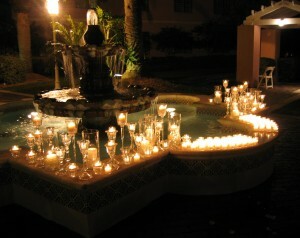 The candles on the fountain blew me away, so classy and stylish……perfection! !